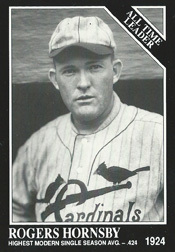 Rogers Hornsby was a 19-year-old scrawny shortstop from Texas when he was promoted from the lowest levels of the minor leagues to the Cardinals. Spurned by his teammates and intimidated by big-league cities, Hornsby seemed more outcast and misfit than elite prospect when he left the Class D Denison Railroaders of the Western Association and joined the Cardinals in Cincinnati on Sept. 3, 1915. At 135 pounds, Hornsby appeared ill-equipped to handle power pitching in the big leagues. Cardinals manager Miller Huggins feared the rookie lacked the strength to generate enough bat speed. Thus began the Cardinals career of the player who would develop into one of the all-time best hitters in the game. Determined to become a professional ballplayer, Hornsby quit high school in Fort Worth and landed a spot with a minor-league club in Hugo, Okla. When the franchise folded, his contract was sold to the team in Denison, Texas. During spring training in 1915, a Cardinals “B squad” club of prospects and reserves played an exhibition game against the Denison team. Hornsby impressed Cardinals scout Bob Connery, who tracked the shortstop throughout the season. The 1915 Cardinals were strapped for cash, especially after fighting the upstart Federal League’s efforts to woo players, and tended to seek inexpensive prospects from low-rung outposts rather than compete financially for top talent from the highest levels of the minor leagues. Connery recommended Hornsby to the Cardinals. In August 1915, Roy Finley, president of the Denison team, agreed to sell Hornsby’s contract to the Cardinals for $600. When Hornsby arrived, he was a stranger to a team whose veterans saw him as a threat to take someone’s job. In his first week with the Cardinals, Hornsby watched the games from the bench. He looked forward to batting practice, but sometimes was blocked by the veterans. When the club was in St. Louis, Connery was there and he pitched to Hornsby after games. On Sept. 10, 1915, the Cardinals were playing the Reds at Robison Field in St. Louis. With the Reds ahead, 7-0, in the sixth, Huggins sent Hornsby into the game to replace shortstop Art Butler. Hornsby followed his manager’s suggestion. Four days later, on Sept. 14, Hornsby appeared in his third game, starting at shortstop and batting eighth against the Dodgers at St. Louis. Facing Rube Marquard (who, like Hornsby, would be elected to the National Baseball Hall of Fame), Hornsby got his first Cardinals hit, a single. In 18 games with the 1915 Cardinals, Hornsby had 14 hits, batting .246. When Hornsby reported to spring training in 1916, he was a strapping 160 pounds. Huggins told him to go back to gripping the bat at the knob. Hornsby performed so well Huggins kept him on the Opening Day roster and started him at shortstop before eventually shifting him to third base. Hornsby was in the big leagues to stay. Second base became his primary position and hitting was his special skill. Hornsby went on to win seven National League batting titles (six with the Cardinals). He twice won the Triple Crown (leading the league in batting average, home runs and RBI) and twice won the NL Most Valuable Player Award. His .358 career batting average is best all-time for a right-handed batter and rates second overall to Ty Cobb’s .366. Hornsby hit .359 with the Cardinals. He has the most career hits by a Cardinals right-handed batter (2,110). The only players with more hits as Cardinals are left-handers Stan Musial (3,630) and Lou Brock (2,713).